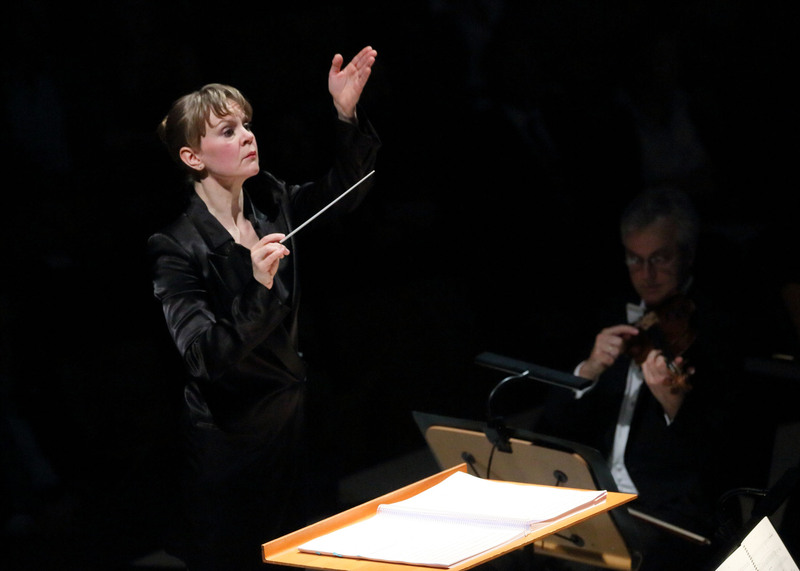 The Los Angeles Philharmonic announced this morning that Susanna Mälkki has been appointed as Principal Guest Conductor of the orchestra. The Finnish maestra’s tenure will officially begin with the 2017-18 season, with an initial contract to last three years. She will conduct three subscription weeks, Green Umbrella concerts, as well as other projects with the orchestra to be announced. I was bummed out that she wasn’t appearing here in the coming season, but this totally makes up for it in its awesomeness. Why? She’s definitely one of the best conductors of this generation. Many, including me, thought she should have been tapped as the New York Philharmonic’s Music Director instead of Jaap van Zweden. Their loss is our gain. Ms. Mälkki is a perfect fit for the LA Phil. She combines a stellar reputation in contemporary music with a proven ability to breathe new life into tired warhorses; her 2013 take of the Brahms 4th Symphony at Walt Disney Concert Hall is still the only rendition I’ve ever unequivocally enjoyed. No matter the repertoire, the orchestra has always sounded in peak form when she’s been on the podium. I can’t say that of all the guest conductors waving his/her arms in front of them. They both bring energy to the stage but in different ways. Saying that his interpretations are more spicy, heart-on-the-sleeve affairs whereas hers are more subtle and analytical would be over-simplifying things, but not by much. More importantly, they have different centers of gravity when it comes to the composers they tend to perform. Do you automatically picture Mr. Dudamel conducting the premiere of Unsuk Chin opera or Ms. Mälkki helming a Tchaikovsky cycle? Um, probably the other way around. Now, there are those among you that were hoping for hoping for more of an eminence grise in the role (e.g. Charles Dutoit, to toss out one popular name) and will point out that Ms. Mälkki musical point of view overlaps considerably with Esa-Pekka Salonen, the orchestra’s Conductor Laureate and extant baton wielding “FinnAngeleno.” I’d reply that this is beneficial, especially given that Mr. Salonen seems increasingly drawn to “projects” — next season’s Reykjavik Festival at WDCH and the recently announced Ring Cycle at Finnish Opera are just the latest example — than to subscription projects. Moreover, overlap is not the same thing as identical. While Mr. Salonen’s European base has been in London, Ms. Mälkki bring a more Continental perspective with past posts in Paris (Music Director of the Ensemble Intercontemporain) and Lisbon (Principal Guest Conductor of the Gulbenkian Orchestra), so their relationships and influences are going to be different. There are also the obvious differences in gender and generation which are bound to manifest themselves. Third, this appointment enables the LA Phil — and us as the audience — to build a deeper relationship with her specifically because she’ll be spending at least three weeks per year in Southern California. That level of commitment between any orchestra and a guest conductor is noteworthy, and it is particularly rare with this orchestra. In recent years, few guest conductors without any kind of official Los Angeles Philharmonic position conducted as many as two weeks, let alone three, in any given season. Since Walt Disney Concert Hall opened, you’ve had the occasional fortnight of Christoph von Dohnanyi, Rafael Frühbeck de Burgos, and Mr. Dutoit, but those were rare exceptions. The orchestra hasn’t had anyone as Principal Guest Conductor since 1981 when Carlo Maria Giulini was Music Director (!!!) Of course, the two he picked were pretty good — you’ve heard of Simon Rattle and Michael Tilson Thomas perhaps? The orchestra hasn’t had an official Principal Guest of any sort since Bramwell Tovey was “Principal Guest Conductor of the Los Angeles Philharmonic at the Hollywood Bowl” from 2008 to 2010, with Leonard Slatkin holding the awkwardly-titled job for the two years before that. The full press release from the Los Angeles Philharmonic is HERE. Tags: Esa-Pekka Salonen, Gustavo Dudamel, Susanna Malkki. Bookmark the permalink. As I recall (at times mistakenly), in the past (70’s/80’s at least)the Phil was much more prone to having Guest Conductors for a couple weeks at a time rather than the one-offs we get from virtually all of the guest conductors. Why is there this parade week after week? My theory: this “difference in philosophy” is not an accident. We are living in a new century – new millennium even – and the times are different. There are more good conductors available now, but fewer great ones – that is why it may be more beneficial these days to have working relationships with more conductors without necessarily focusing on few “chosen” ones. Once again, this is just a theory of which i have no proof, so: discuss amongst yourselves. That’s an interesting perspective, and I don’t disagree. Along similar lines, I figured that it was a balance of artistic, interpersonal, financial, and geographic considerations. – Artistic in that you have to find the right conductor(s) with whom you’d want to have spend two weeks with the orchestra because they are “good enough” to warrant the investment in time (either because they are well-established, dare I say “masters,” or they are rising stars). – Interpersonal in that the individual conductor has to have the right rapport with the 100+ musicians in the orchestra, regardless of skill; just like any attempt at building a relationship, there are certainly examples of a maestro/maestra having a magical connection with one pre-eminent orchestra while falling flat in front of a different one. – Financial in that I’m guessing it’s more expensive to hire two single conductor for one week each than one conductor for two; I have nothing concrete to base that on, just a guess. – Geographic in that Los Angeles is 5 hours further away by plane from traditional European conducting capitals vs. East Coast cities, and that distance makes it harder to attract your average conductor based in London, Amsterdam, Germany, Austria, or Italy. There’s certainly more to it than that, but I don’t think any of the bulletpoints above can be ignored in such calculus. These are all valid considerations, but all of them were just as valid before the year 2000 as well – therefore none of them explains the change that “music lover” asked about.